Welcome to the most wonderful season of all! I am a Christmas aficionado. Everything good in my life has happened in December. I was born in December. My husband and I began dating in December 2007. We got engaged the next December (Christmas Eve!). And, we got married the next December! Birthday – Anniversary – Christmas – can you tell I am in my FAVORITE month!?!? I am planning twelve days of everything wonderful. Every day I will give you awesome Christmas tips – from shopping – to decorating – to baking! Make sure you stop in every day and get a new idea to start this season! I will link the whole series on the top menu! Today it is all about Christmas cards! I know so many of us wait until the last minute to order and mail Christmas cards – so I have the solution for you! I have tried saving my Christmas card address list several ways – and finally decided that a good ol’ contact list in my computer is best! I have an Address Book group called “Christmas Card” that I add to every year! If we receive a card from a new friend, I immediately add the address right into my computer – no more saving slips of envelopes! For me, this takes the longest amount of time! I like to find a good deal when I buy Christmas Cards – and I just don’t want to settle for the $100 variety! This year I found a STEAL! I ordered my cards from them, and had my cards in a WEEK. Their service was easy, fast, and no-nonsense. For photo cards, you can upload your photos from your computer – or from Flickr! LOVE that feature. My husband was super impressed by the quality matte stationery stock paper – which is one reason we decided these were an EXCELLENT buy. Once we picked out our photo (you can see it above! ), I had these babies ordered in less than ten minutes. As opposed to other photo card companies, these cards are cheap. Most Pikcal Cards are $15 for a set of 12. AND, just for you, Pikcal is offering a 20% discount! AND, they have free shipping! 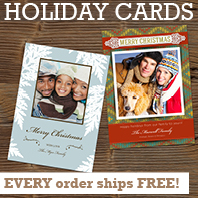 That means these cards are just $12 for 12 cards – shipped to your door. Try to beat that!! Use code blogcard20 for to get your 20% discount! This is when we all stall. Really, we have to address piles of cards? Well, here is your excuse to have the most festive quiet holiday moment – before all the craziness kicks in! I like to take a few hours – either one evening or on a Saturday – and create my own little holiday sanctuary. I turn on a Christmas movie and make a cup of tea. Add a few Christmas cookies and maybe some soft Christmas music – and for the next few hours, I am in Christmas heaven. Try it. You might want to sit down and write all those cards! While we are talking beautiful designs – I want you to meet my new sponsor Michelle with Hey Love Designs! She has a GORGEOUS website where she shares all her favorite DIY pretty things. (Seriously, check her out!). Hey Love Designs specializes in print design and party accents. The blog focuses on Michelle’s love of DIY that she loves to share with others. It’s so easy to add a little flair to a party or your home just by pulling some fun supplies together – usually things you already have at home! One of my FAVORITE posts is I Like Big Buns and I Cannot Lie! I love a good top knot bun – and this girl includes a DIY for a bun bow! Super cute, y’all! I absolutely love sharing my crafty adventures. I’ve always enjoyed making things myself and I found that my friends loved hearing about what I was making. The blog definitely focuses more on DIY than selling products in my shop. Make sure you stop by and take in all the beautifulness! « Get Excited! The Twelve Days of Christmas are HERE!